The cloud-based service that lets you manage certification jobs anytime, anywhere, with anyone on any device. LinkWare Live is designed to increase the efficiency of contractors performing certification of cabling installations. It starts with the Project Manager identifying the links to be tested, the tests be performed and who will perform them. Next, field teams download their test settings to their field gear, label and test the installed links, and upload the results to LinkWare Live. Supervisors can track the progress of each job and receive notifications when unexpected results appear. When the work is done, a single click generates customer-ready reports. LinkWare Live also tracks the location and service status of your fleet of testers. The result is fewer errors, faster reporting, and a boost to the bottom line. Faster Reporting - Upload test results over Wi-Fi straight from the jobsite to the correct project database. Then generate certification reports with a click. Teamwork - Divide large projects into smaller subprojects and assign to teams or subcontractors. Share results with customers or vendors. You control who sees what. 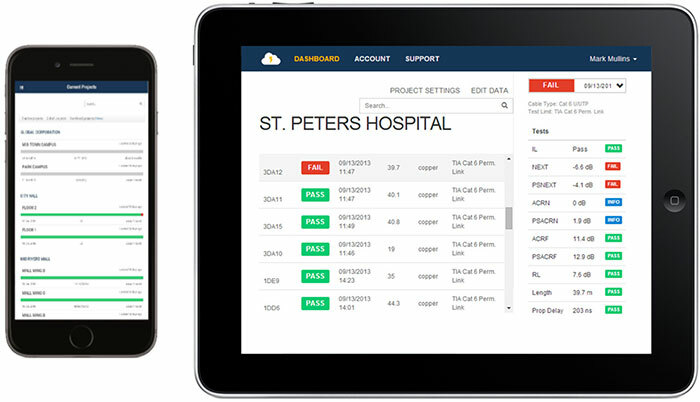 Visibility - Get an overview of every project from any smart device. Drill down to each individual test. See unplanned test limits and cable ID’s in your results. Setup Testers and Labelers - Define cable IDs and test settings from your PC or tablet. Then send them to the testers or labelers at the jobsite for mistake-free testing. Supports Brady, Brother, Dymo and Epson. Asset Management - Track the last used location and monitor the status of all testers to ensure they are always calibrated and running the latest firmware. 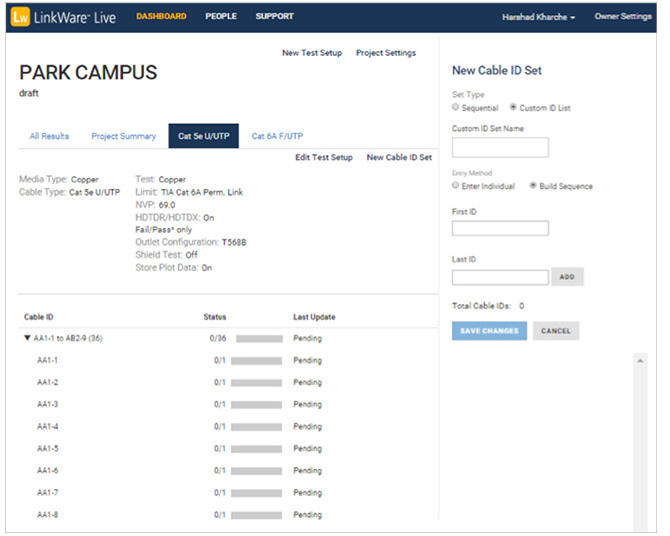 Streamlined Testing of SYSTIMAX™ Fiber Solutions - Simply enter a basic link information into the proprietary CommScope Link Loss calculator and it creates custom limits based on link type and measured length. Create and manage test setups and cable IDs with browser-based ease. 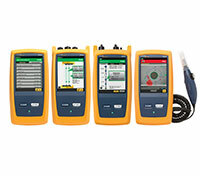 Built-in CommScope SYSTIMAX Link Loss calculator simplifies fiber testing setup. Dashboards in LinkWare™ Live provides insights on the progress of your certification job on your smart phone or any browser enabled device. This ensures your certification jobs and projects are completed on time. The ability to track multiple jobs simultaneously also improves scheduling and resource allocation to ensure maximum productivity from technicians and instruments. 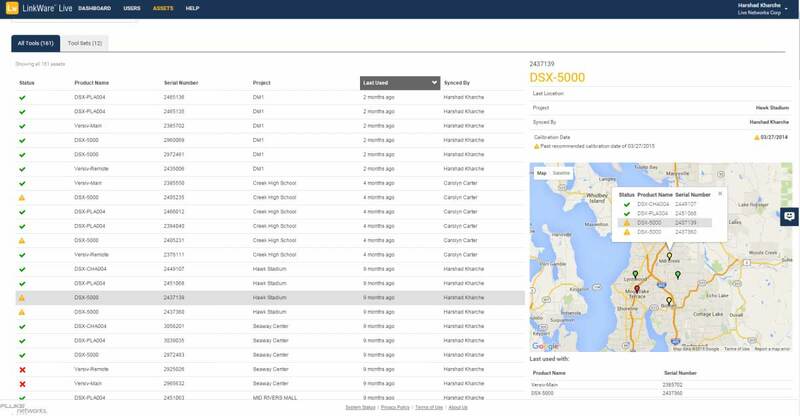 Customization of the dashboard enables you to group multiple projects, matching the way you do business. The ability to archive projects ensures only relevant data is displayed on the dashboard. SYNC Projects they are invited to. Send Results from a tester to LinkWare Live. View results for Projects or SubProjects in LinkWare Live. View results for their Projects or SubProjects in LinkWare Live. Test Results Management is made easy with LinkWare Live. This means that you spend more time on tasks that matter, complete jobs faster, and get paid sooner. The Versiv testers directly integrate with LinkWare Live allowing test results to be uploaded to www.linkwarelive.com. Once the results are stored remotely, you can view them on any internet enabled smart device with a browser anywhere and at any time. Often you have to use multiple testers for a job and sometimes these testers are on multiple sites. Collecting and consolidating data from each can be time consuming. Now with LinkWare Live, data from different testers and sites can effortlessly be consolidated into a single project. This minimizes retesting due to missing results. Create certification reports from anywhere on any device. Generate a PDF of the certification report from the cloud in one click for faster, more efficient use. LinkWare Live now works with any browser based device so you can use your favorite device to enhance your workflow. Create project test setups and cable IDs with browser based ease and save them in LinkWare Live. Once saved they can then be download to any tester. Avoid unnecessary travel to the jobsite. 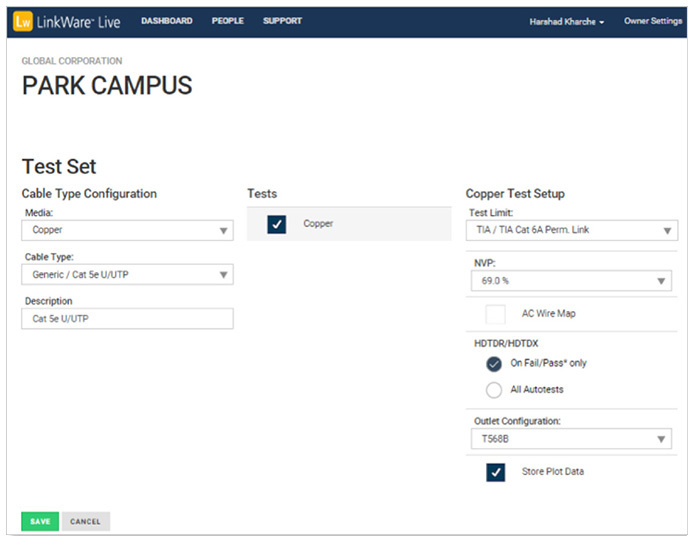 Copper and fiber test setups can be created from any browser. The options available on the browser are the same as those while creating the test setup on the tester. But it's faster to create the project setup on the browser as the number of screens needed has been reduced to just one. Both sequential and custom ID lists can be created from the browser ensuring cable IDs are generated quickly as defined in the job specification. Cable IDs can also be created in the browser by importing Microsoft Excel or CSV files. In the results LinkWare Live shows when unplanned test limits or cable IDs are uploaded. Along with the notification LinkWare Live also provides the capability to accept or reject these test results. Always ensure tests are following the specification required for the certification job. With LinkWare Live you will catch these errors early in the project timeline, eliminating additional calls to retest. LinkWare Live asset management provides an intuitive way to monitor testers in the field. Any user with the permission to view asset information can quickly identify the last used location of the tester and verify on who is using the tester. LinkWare Live informs you 60 days in advance if any tester needs to be calibrated. It also provides notification on the firmware version of each tester. Testers that need to be updated can be updated remotely, ensuring your Versiv has all the latest features. LinkWare Live Asset Management dramatically reduces the amount of time spent locating and managing testers in the field and ensures your team is always ready for the job. Create a summary certification report for each certification job directly from the browser so end customers can quickly be updated about project progress. The world's leading providers of labeling solutions work with LinkWare Live to make labeling faster, simpler, and error-free. By accessing label identifiers stored in LinkWare Live, these solutions remove the tedious step of re-entering long strings into the labelers. 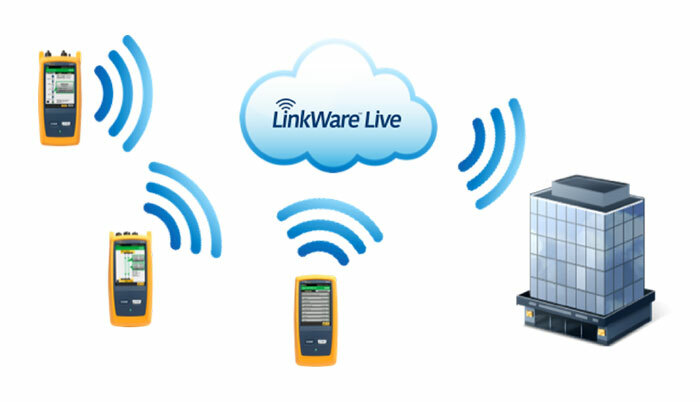 For a complete list of compatible products, how they work with LinkWare Live and availability, please visit: www.flukenetworks.com/linkwarelive/linkware-live-integrations. 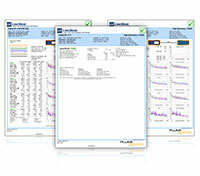 Linkware™ PC Cable Test Results Management Software is the reporting engine for LinkWare Live. LinkWare PC connects to LinkWare Live and allows you to easily download uploaded results and to perform targeted analysis. Reports created from LinkWare are the industry de-facto standard and are recommended by leading cabling manufacturers, consultants, and industry experts. Which license is right for you? LinkWare Live Professional is focused on improving productivity for the project manager with greater control on project setups and notifications. *See supported countries at: www.flukenetworks.com/LinkWareLive/countries.